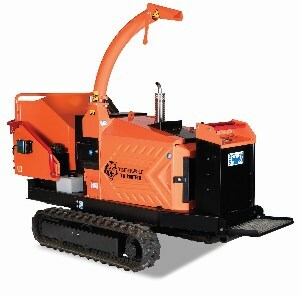 If youre looking for the ground-covering performance and the outstanding efficiency you've come to expect from Timberwolf, the TW 280TFTR 8 tracked chipper will get in and get the job done. There is also Timberwolf's legendary no-stress auto-feed control for smooth operation, combined with a heavier rotor giving added inertia to get the job done quicker. The TW 280TFTR has a low vibration and ergonomically designed ride-on platform for ultimate comfort and safety. It has a two-speed tracking system, low speed gear to negotiate difficult terrain and a higher speed gear to cover distance efficiently. Both speeds are infinitely variable with a conveniently mounted engine throttle. It has a better ground clearance of 245mm to tackle uneven surface, with smooth running tracks and low centre of gravity to enhance stability on different gradients.